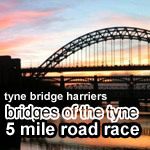 The inaugural running of the Tyne Bridge Harriers Bridges of The Tyne 5 Mile Road Race will be held on the evening of Tuesday 10th July 2012. The race starts at 7.15pm. One of the first objectives after the establishment of Tyne Bridge Harriers was to have their own race. Initially planned as a 10k heading East from the Quayside, road closure costs meant that the race had to be changed to 5 miles and head west instead. The Tyne Bridge will have the Olympic rings installed on it for the duration of the games so it was important that the race incorporated the view to provide a stunning image. This is the first race since the 1990s that starts and finishes in the City Centre and Tyne Bridge Harriers are hoping it will become an annual event and develop a great reputation as a fast course. Starting and finishing on the historic Newcastle Quayside the race will incorporate running under or past 7 of the iconic bridges of The Tyne. The route takes runners West on the riverside path, before turning at the Newcastle Business Park returning Eastwards to finish on the Quayside adjacent to the mouth of the Ouseburn. The course will have mile markers and entries are limited to 300 and are going fast!